ARE YOU CONSIDERING TRAVELLING WITH YOUR PET NEXT YEAR? If so, please read on or Brexit might seriously get in the way of your plans. Just like everyone else, we have no idea what effect Brexit may have on the pet travel situation. We do know that pets will still be able to travel but we don’t know what the rules surrounding that travel will be, particularly in the event of a no deal. So if you add it all up it could take 4 months to prepare your pet for travel in a no deal scenario. 1. 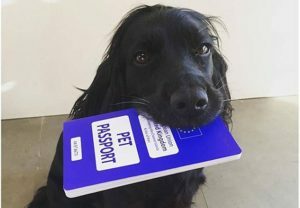 If you are travelling and returning to the UK with your pet BEFORE 29th March 2019 you just need to have a valid passport and a rabies vaccine done within 3 years. 2. If you need to take your pet to Europe anytime in the 4 months following 29th March 2019, then to be absolutely safe you will need to make sure you have an up to date rabies vaccine and then blood test your pet. If your pet’s rabies vaccine is not up to date and you need to get the vaccine done then the process takes at least 4 months before you can travel. 3. If you don’t need to travel with your pet between 29th March 2019 and 29th July 2019, then wait and see what the new rules are as the scenario above may not happen if there is some kind of deal. I hope this makes sense, if you have any questions please don’t hesitate to get in touch.